After a week in Hong Kong, Marita and I flew to Bangkok (Thailand) where we spent an active three days touring the city before boarding the Diamond Princess for our South East Asian cruise. three-wheeled tuk-tuks still zip through any opening in the gridlock and provide an amazingly efficient, if precarious, alternative. Apart from the traffic, one of the persistent hazards in downtown Bangkok is the gem store 'tout,' that seemingly helpful ubiquitous local preying on tourists at every turn. His/her friendly directions invariably lead to stores selling local jewellery of all sorts where legions of clerks will seek to divest you of your bank balance. Political Calm and Flourishing TourismA few months ago Bangkok was in political turmoil and the international airport was completely shut down by protestors. Things are calm at the moment and the airport is functioning normally. 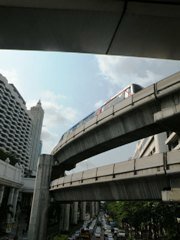 Within a matter of months, there will be a new train operating between the airport and downtown. 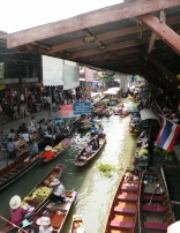 We spent a full day in the countryside visiting the floating markets of Damnoen Saduak about an hour and a half from the city. This is a dreadful tourist trap, but worth a visit nonetheless. This area is crisscrossed with a system of narrow and shallow canals (klongs) used by the local people to get around. Many people live here in this swampy area in houses raised on stilts. For the tourist, the adventure begins with boarding a narrow flat-bottomed boat propelled by a rear motor. The motor is attached to a long shaft with a propeller, which trails just below the surface. The boats are noisy, but cleverly adapted to water conditions. After about a half hour’s ride through a maze of canals we come to a group of shops full of souvenirs and swarms of tourists. Dozens of boats bump each other nearby. Half of them are filled with tourists, and the rest with locals selling fruit and vegetables and more souvenirs. It's difficult to decide which is worse: being bottled up cross-legged in the boat surrounded by waterborne hustlers or wedged between sweaty tourists in the stores on land. Perhaps there are people who enjoy this kind of thing, but I’m not one of them. Let me out of here! But, as they say, that too is Thailand and any number of other places on earth where masses of people are forced to do whatever they can to survive. The Rose Garden: Flowers, Fast Food, Elephants, Oxen and Music! On the way back to Bangkok, we stopped at another tourist gathering place, the Rose Garden, for lunch and a stage show. The roses were not in full bloom this time of year, but we did see some lovely orchids. The food at this attraction is, unfortunately, little better than hospital fare designed to get 500 people in and out of a dining facility as quickly as possible. The hour-long stage show included some of what we had seen at a local hotel in Bangkok some forty years ago - Thai temple dancing, Thai boxing and a souped-up orchestra playing on traditional instruments - but the Rose Garden offered up a bigger, if not better, production. 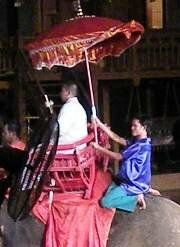 The orchestra opened with a variety of popular tunes from different countries; morphed into Thai music to accompany the story (with voiceover in English) of Thai traditions and culture being told on stage through a variety of scenes – some of which included live elephants and oxen! ; and closed with the tune, It’s a Small World After All, in appreciation, perhaps, of all the folks who had travelled so far, from so many different places, for this experience. As we continued our drive back to Bangkok, we were reminded that Thailand is still primarily agricultural with rice the number one export product. Coconut plantations abound, and there are farms devoted to salt harvesting, using ancient manual techniques based on evaporation. 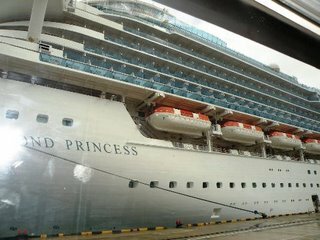 The Size of a Small Town - Diamond Princess Strives to Please One and All!In Laem Chabang, a container port two hours drive from Bangkok, we boarded our home for the next sixteen days, the cruise ship Diamond Princess. The thought of spending that much time locked in with 4,000 other people – 3,000 passengers and 1,000 crew – is enough to bring on palpitations. From my perspective, the key to enjoyment on a cruise is to understand your own needs and phobias and plan accordingly. There are places on board where heavy drinkers, loud talkers or party animals gather. It doesn’t take long to identify these places and learn to avoid them. 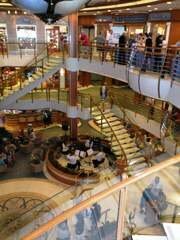 If you have a room with a balcony, you can even spend virtually the entire cruise in your own space. Food comes to you when you want it at no extra charge; wireless internet is available in your cabin (for a price); and writers can happily do what they do in relative calm, watching the waves and the ship traffic go by. Cornucopia of Music at Sea Fits the Bill for Most Then there is the music, and plenty of it. There are twenty or thirty musicians (singers and instrumentalists) on board and they seem to be playing almost continuously in all manner of configurations. As the Diamond Princess Orchestra, some of them make up the pit band for the nightly stage shows; as Liquid Blue, others can be heard playing early rock music in the Explorers Lounge. Still others come together as a 40s ‘big band’ in the Wheelhouse Bar; as the contemporary rock band Equinox in Club Fusion; or as a string quartet in the Atrium. Something for everyone? Well, not quite. The average age of passengers on board Diamond Princess appears to be 65 or more, and the music is designed to suit their age, tastes and cultural profile. There is no music offered that requires concentrated listening. The cruise lines must have learned, long ago, that retired people, on vacation, are rarely looking for concert performances, or what those of us who are avid classical music lovers would call ‘serious’ music. I am not surprised that there are no classical music concerts on board the Diamond Princess; nor does it surprise me that there are no courses on classical music included in the Scholarship@Sea Program in spite of the fact that most of the scheduled onboard activities seem designed to appeal to small, specific interest groups. For those who are interested, there are some cruises that do specifically target this niche market. There are other ways to satisfy intellectual curiosity on board the Diamond Princess. There is a library and plenty of good reading material. There are also daily lectures given by experts on the ports of call. On this cruise, former ABC News correspondent Tiiu Lukk and art and architecture authority Deborah Fraioli gave talks on Ho Chi Minh City and Nha Trang, before our arrival in Vietnam. I complemented that information with my own reading on the subject, and between lectures I took in the Jazz Jam by the Diamond Princess Orchestra and spent a little time in the Golf Simulator to hone my game. True to its promise, Diamond Princess offers fun and games for every taste. In my next report - some thoughts on sensational Singapore! Paul E. Robinson is the author of Herbert von Karajan: the Maestro as Superstar and Sir Georg Solti: his Life and Music, both available at http://www.amazon.com. Hong Kong Arts Festival Ends on a High Note! Mendelssohn at 200 Still Thrills and Inspires!